Exactly how much refrigerant is in there? A concern that comes up regularly when troubleshooting A/C problems is whether an A/C system has too little refrigerant (hello leaks) or too much of it (hello overcharging). The traditional way to do this involves drawing out all the refrigerant (often with expensive, specialist equipment), which adds considerable overhead to a DIY-er like me as I then have to worry about sourcing compressor oil or recycling the existing refrigerant. So, is there an environmentally-conscious way to determine the amount of refrigerant present inside an A/C system that does not rely on complete evacuation? You can draw out all refrigerant from a system with no expensive equipment. 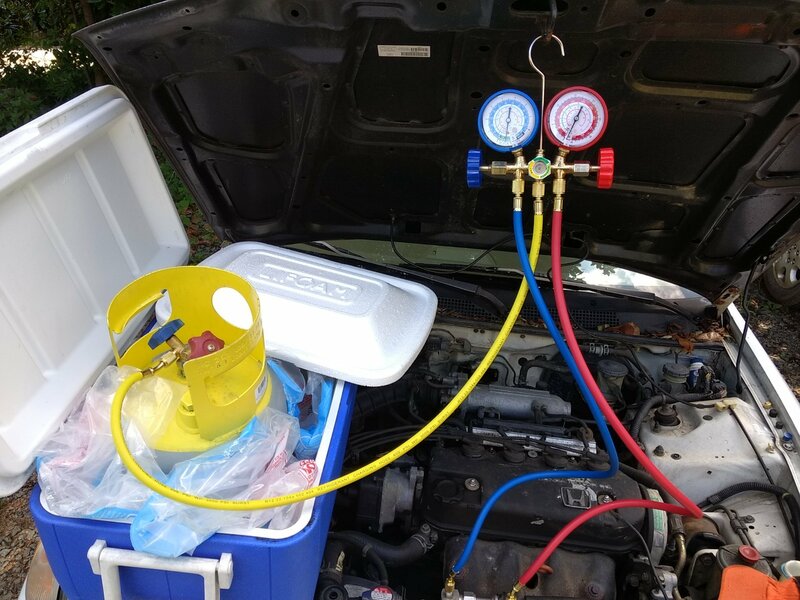 All you need is a hose (preferably with manifold gauge), a suitable storage tank, a decently insulated container (like a large cooler) that it fits mostly inside, and dry ice to pack around it, around 10 pounds, or less if you have a liquid acetone or alcohol bath to transfer the heat more efficiently out of the tank. Dry ice is around -70°C, and automotive refrigerants liquefy around -25-30°C, so all (modulo some extremely low vapor pressure) the refrigerant will liquefy in the tank; you can confirm this by observing vacuum on your manifold gauges, which should match the vapor pressure of your refrigerant at whatever temperature you can get the tank down to. Dry ice will run you about $2/lb and can be purchased at Kroger and some other grocery stores. You can get a 30 lb tank for around $80-100. I got one off Amazon. In theory, if you have an empty refill tank that can hold at least as much as your system, you could use it. This is of questionable legality, and dangerous if there's any risk you might overfill it (assuming it might return to a gaseous state before you move it back, in which case an overfilled tank could explode), but it's not as bad as actually pumping hot pressurized gas into such a tank. Not the answer you're looking for? Browse other questions tagged ac diagnostics diy or ask your own question. How do you detect and deal with a refrigerant leak? How much isopropyl alchcol to deodorize AC ducts? Why does a diagnostic tool that can erase messages cost so much more? How do A/C professionals dispose of refrigerant? Can I use empty refrigerant bottles to store used refrigerant?